Inspired by recent resurgence of contemporary and transitional kitchen design, the Conrad collection's clean flowing lines merge with strong edges to create the perfect look for your kitchen or bath. 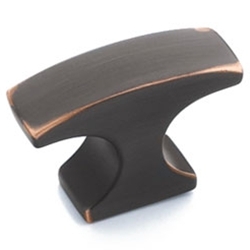 The Amerock BP29203ORB Conrad™ Knob is Finished in Oil Rubbed Bronze. While there are no hard, fast rules for placement of a knob or pull on a cabinet door, most cabinet makers will locate them approximately 3"-4" above the upper non-hinged corner on base cabinets, or the lower non-hinged corner on wall cabinets. However, the decision is your to make! When drilling for a knob or pull, a 3/16" hole is recommended for most styles. The exception is pulls that have "studs". A stud is simply an extension of the molded screw holes. If a pull has a stud, then a 1/4" hole is required with studs sitting securely in the wood.For choosing the right size pull, determine length by measuring from hole to hole, not by length of the pull itself. Amerock® includes 8-32 x 1" long machine screws with most knobs and pulls because the typical cabinet door or drawer front is 3/4" thick. This screw length should work in most applications. However, if your cabinet doors or drawer fronts are thicker than 3/4", then you will need to use longer screws for mounting. Check the thickness of both a cabinet door and a drawer front in your kitchen, as the thickness dimensions may not be the same. In general, the screw length(s) used should be 1/4" longer than the thickness of your cabinet door or drawer front material. It is not uncommon for some drawers to be constructed with a 3/4" thick front attached to a 3/4" thick drawer box. In this situation, the total drawer thickness is 1-1/2", making a 1-3/4" long screw necessary for mounting.